Are you an optimist or a pessimist or the one hanging in between? Do you know what is making you an optimist or a pessimist? If you are an optimist then that’s a blessing to you, right. But, if you are a pessimist then you are having a hard time in life. Every pessimist knows that being positive is really difficult. Even most of the people who struggle with the inner negativity, they try hard to become an optimist but become unsuccessful. Apart from the super optimist and the pure-pessimist, there are people who keep hanging in between positivity and negativity. Are you the one hanging in between? If you struggle to have the positive flow all the time and wondering how can I take myself to a level where I can be super positive, then have patience, in this magical Universe you have a solution for everything. If you are pure-pessimist or you are the one hanging in between positivity and negativity, then you are reading what you need at this moment. In this post, I am sharing the simplest secret of what is making you an optimist or pessimist. And most importantly, understanding the reason will help you find the key to transforming your negative self into pure positive one magically. Your success and manifestation depend upon the kind of person you are, whether you are an optimist or pessimist. Can You change from A Pessimist to An Optimist? The answer is YES. You CAN. Now is the time when you must leave the negativity behind and start your magical transformation of becoming an optimist. Now you must understand what is making you a pessimist or an optimist. You have a voice within you. You are the one speaking and you are the one listening to it. Every moment of the day, the voice is saying something. Either it’s telling you an amazing story about you or it’s talking about your weaknesses. Either it’s telling you how blessed you are or it’s telling how unlucky you are. Either it’s telling you what possibilities you have or it’s telling what obstacles you have. This voice within you is your powerful voice. This powerful voice is creating your reality. This voice can build or break your dreams. This voice has the power to give you a push to go beyond any obstacles and weakness to live your greatness. Don’t just be a passive listener to this voice, listen to it actively. Because this voice has the ability to manifest what you can and what you can’t achieve in life. But you must understand one thing, normally this voice tells you the negative aspect of life, it tells you more about what you don’t have, about why you can’t achieve your dreams and about why others are better than you. No one not born as an optimist or pessimist, but choose to become who they want to be. Consciously or unconsciously you become the person who you are by listening to this voice within you. The positive or negative tone of this voice formed based on other people’s advice, the conversation you heard and the experiences you had in life. From childhood slowly this inner voice starts taking its shape and becomes optimistic or pessimistic. So, what’s your inner voice telling you? Is it telling you the gift and blessings of life? Or is it telling you the problems and obstacles you have? Change The Voice within You. Every single day you have the choice to change this voice and become the person who you want to be. Whether you choose to be an optimist or pessimist, you always have the choice. And you must choose to be an optimist in life. Many times you find yourself being negative and have a hard time becoming positive. Even many times you wonder why some people are so lucky and always positive in life and why not you. You consider them the lucky or favorite child of God, but the truth is they are no different than you. They are made from the same supreme energy. What makes them positive or an optimist or in your words “Lucky” is the way they formed this inner voice. These people always focused on listening to only positive words from this inner voice. They see the possibilities in everything they do and everywhere they go. But you must be thinking, what about me? How can I become super positive? How can I take myself to the magic of becoming an optimist? If you have a tough time in life or you can see only negativity around, if you have become a pessimist then you must understand, why you have become like that. You have become so negative because you are only listening to the negative voice within you and you are not talking back positively. You are only listening, but you are not telling it that you can change your life, you are not protesting that you are not a victim of fate anymore. If you have lived your life so far being negative and felt miserable to become a pessimist, then I must tell you, your struggle has come to an end now. You don’t have to stay like that anymore and struggle. You can change it and the change can begin from now. Don’t just be a listener to your inner voice but start talking to it. Talk to your inner voice all the time. If the inner voice tells you something positive agree with it and say YES, YES, YES. But more importantly, when the inner voice tells you something negative, shout back and say “No it’s Not True” and tell the opposite with belief that how strong and blessed you are. Your inner voice will test you again and again, to check whether you are resolved to live your greatness or not. When you keep talking about strength and conviction, it will slowly change itself. Then it will start telling you how magical your life is, how powerful you are and how you are destined to live your dreams. This inner voice is your gift to convert your weaknesses into your strength. 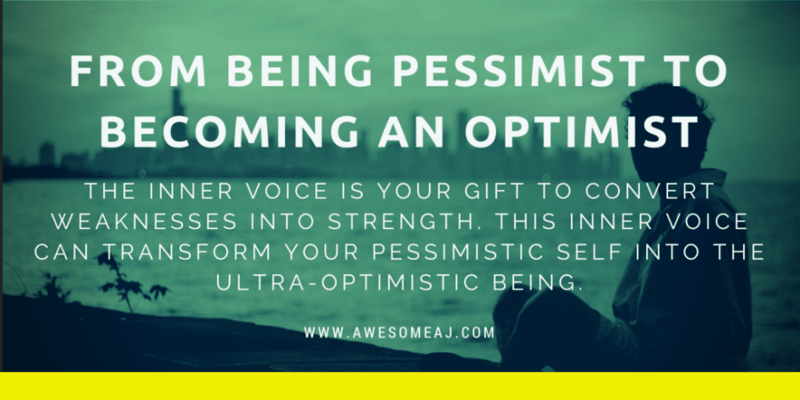 This inner voice can transform your pessimistic self into the ultra-optimistic being. Stop being just a listener to this inner voice, recognize this inner voice and give your agreement to its positive talk or shout back and change the negative one. Change the voice within and see the world changing outside. 1. Start listening to the inner voice. Recognise the inner voice, whether it is positive or negative. Only if you start to recognize it consciously then only you can change it. Most people wonder why they feel negative or frustrated too much. It’s because they don’t recognize the inner voice. If you start listening to you then you can change it. If your voice is negative then it will bring more negativity into your life. If it’s positive then it will bring more positivity. So always remember the simple rule of Law of Attraction: Like Attracts Like. As mentioned in the point#2 like attracts like. So if your voice is positive about something then say YES to that. That will bring more positivity in that area of life. Law of attraction will bring more of that positivity. If your inner voice in negativity about something, immediately change that voice. So that your vibration and law of attraction will change to attract positivity and not negativity. Note down all the positive statements I have given you in this article in your notebook or phone and read them 2 to 3 times daily. Read the above statements daily to become much more positive. Think about your life and write down all the area which are negative in your life. May it be your job, money, relationship or health. Write down in the big font “I AM THE MASTER OF MY FATE, I AM THE CAPTAIN OF MY SOUL”. Whenever you feel negative or sad about something remind yourself this statement and you will get changed up instantly. You can also note down this statement on your phone as a reminder or note to the card you have prepared on the day#2. I am sure now just by reading this you got changed up, isn’t it? Listen happily, talk positively and transform from being a pessimist into an optimist magically. Please share this soul-inspiring post on Facebook, Twitter and Google+ buttons below. Dear Sir thank you very much for today. I love my life. I am so happy. I AM THE MASTER OF MY FATE,I AM THE CAPTAIN OF MY SOUL. I’M THE MASTER OF MY FATE ,I’M THE CAPTAIN OF MY SOUL. Kavya shetty- I’M THE MASTEREO OF MY FATE , I’M THE CCAPTAIN OF MY SOUL. Kavya shetty- I’M THE MASTERE OF MY FATE , I’M THE CCAPTAIN OF MY SOUL. Thanks AJ IAM THE MADTER OF MY DESTINY AND CAPTAIN IF MY SOUL. THANKS FOR TIDAYS COURSE. Shreenija I am the master of my fate I am the captain of my soul. Thank You Suchi and I feel grateful reading your every words. It’s truly magical and this post is meant to help more and more people overcome their inner struggle and become a super optimist in life. Thank You. Thank you so much for sharing with us and enlightening us. Now I am so ready to take on this year. God bless you always. Thank you somuch sir, you are really awesome & my life is also awesome too.. This is really an encouraging article. I am sure it can bring lots of changes with in ourselves if we stick to it. Keep it up. Thank You Yesuf for reading my blog. Do follow it and see your life changing magically. Will practicing the discipline of gratitude help in making the inner voice more positive? Yes .. it will make your inner voice positive and make you an optimist also. So what I do right now, is right before going to be I list all the good things that happened to me during the day & right after getting up in the morning, I list all the things I am thankful for? Is this a step in the right direction? At night and in the morning. Thank U Trishala… Gald this is helping you. This is an awesome article.i loved reading it,thank u for this wonderful article. Bankim Parikh – I am the master of my fate. That’s Awesome Bankim.. Live Your Dreams. I am the master of my fate , I am the captain of my soul…thanku.. I AM THE MASTER OF MY FATE, I AM THE CAPTAIN OF MY SOUL.” – Also You must make a choice to take a chance or your life will never change. Kalpanaashri – I am the Master of My Fate, I am the Captain of My Soul! Thanku very much ajay sir, I really need thz… I am felling heavy from inner side.. now m feeling gud. Thanku god bless you..
Thanku aj its really a nice article.now i m the master of my life and the caption of my soul . Thank You Hemant.. I am glad it helped you. CHETAN- I M THE MASTER OF MY FATE, I M THE CAPTAIN OF MY SOUL. Thanks awesome AJ for such an awesome article. Super Awesome.. Enjoy the journey. I am the master of my fate, I am the captain of my soul. Thank you Ajay sir. Awesome Ramya.. Stay Inspired always. A million thanks to u AJ,u can’t believe how much I was inneed of this things. I AM THE MASTER OF MY FATE,I AM THE CAPTAIN OF MY SOUL. Really it’s awesom,THANK YOU THANK YOU THANK YOU VERY MUCH. Live Your Dreams.. Your are destined for Greatness. Antonia – I am the master of my fate, I am the captain of my soul. Thank you very much once more AJ! More and more success to you. Thank You Akansha.. More Success to You. I am master of my fate.. I am captain of my soul.. thank you thank you thank you sir.. Yes Hemant .. already you are. Thank You. You are awesome. I feel like You are sending beautiful and tiny sparkles of light into my life. i feel hopeful. Thanks so much. Loads of Gratitude Sweta.. The Law of Attraction brining the right thing into your life. Abhishek Mathur is the master of his fate and the captain of his soul..
More Power to You Abhishek. Hi AJ, Thanks a lot for everything you are awesome, no doubts. Loads of Gratitude Pam. Time for you to shine. i am enjoying my transformation…it simply a lovely feeling….thank you thank you thank you !!!!!!! Live your dreams to Fullest. You are the creator. Thank you so much AJ..
Live You Dreams with Law of Attraction. Amit mishra- I AM THE MASTER OF MY FATE, I AM THE CAPTAIN OF MY SOUL. Rajeev Garg I am the master of my fate,I am the captain of my soul. Entire Universe is working for me..I am accepting all that Universe wants me to get in and with me. I am reaching the place the position which Universe has reserved only for me. Universe is opening all the opportunities for me where I Am Earning a Lot.. More than I desire. Thank you Ajay sir for being with Me in this Journey. RUPA, I M THE MASTER OF MY FATE, I M THE CAPTION OF MY SOUL. THANK YOU THANK YOU THANK YOU. Yes Rupa. Live your dreams with Law of Attraction. I AM THE MASTER OF MY FATE ,I AM THE CAPTAIN OF MY SOUL. Supriya – I am the Master of My Fate, I am the Captain of My Soul! Thank you so much Awesome AJ!!!! Edwina Asare – I am the Master of My Fate, I am the Captain of My Soul. Thank You Edwina. Your dreams belong to you. THANK YOU AWESOME AJ.. YOU ARE AWESOME! More Power to You Aparna. Live Your Dreams. JANICE – I AM THE MASTER OF MY FATE, THE CAPTAIN OF MY SOUL! Janice .. You are Awesome. I am Julie, and I am the master of my fate and I am the captain of my soul! I am abundance, I am success, I am ready!!! You are the Success and Happiness. More Power to You. Thank you Awesome AJ for this superb full packed article! I am ready to move to be Super Optimist! Magical Gratitude Mitra. You are the Universe Creating Your Life. Loads of Gratitude Mancy .. You are destined for all your dreams. Change the Voice within and change your life. I’M THE MASTER OF MY FATE.I’M THE CAPTAIN OF MY SOUL…………..THANK U AJ AND PLZ……………GIVE ME UR SOLUTIONS TO MY PROBLMS WHICH I SENT U YESTERDAY. Hello GUYS………………………..CAN ANY ONE TELL ME HOW TO DO THIS MAGICAL PRACTICES? I’M DOING IT REGULARLY ……………BUT NOT GETTING HOW TO DO IT ? 2.I’M DOING MAGIC PRACTICES WHICH R NOT SENT BY AJ SIR …..THAT’S IT . Hi Tanu … what you are doing is right. But this is not 28 Magical Practice but this is 21 Days Law of Attraction Course. As you are doing Magic from the book along with thise course is awesome. Keep doing this. Ravi .. That’s awesome. Live your dreams. I’ve read this post many a times. But everytime I read it I find something new in it. AJ, Thank you for magnifying my positivity. Yes, Kshitij ..You have read this before but the Wisdom of Universe is like this..the more you explore .the more you will find. Happy to have you on this journey again. Massive SUuccess to You. Yes.. Rhianna.. You are the Creator of Your Life. Magical Gratitude Bindu and I am happy to have you on this journey. You are the magical being. More and More Power to You. More Magical Power to You Bindu.. Listen to Inner Voice and live your dreams. Magical Power..with love and gratitude Ram. dimak : i am the master of my fate .i am the captain of my soul. Magical Success to You Dharanidhar. THANK YOU, THANK YOU. THANK YOU SIR AJ.. YOU ARE AWESOME! Loads of Gratitude Olivia. More and More success to you. Thank You. Parag, I am the master of my fate and i am the captain of my soul. You are the Master of Your Dreams and Life Parag. Yes, Ashish. You are the master of your life. Change your life with Law of Attraction. Preeti, You are the creator of your life with Law of Attraction. You are the Creator of your life Nidhi. Thank You. I AM the Master of my fate, I AM the Captain of my soul!! thanku thanku thanku AJ sir…for the 3rd day course..really amazing.. I LAVANYAA RAO..I AM MASTER OF MY FATE, I AM THE CAPTAIN OF MY SOUL…..
Dear Lavanyaa.. I was travelling to comments were on hold. Now you can see all your comments. Please share your thoughts. Nikola- I am the master of my fate, I am the captain of my soul. I am very grateful to be part of this wonderful course. It’s simple to follow and info is extremely easy to digest. Great work, AJ. Thank you. Magical Gratitude Dear Venetia. Live your dreams. Beverly Banks-I AM THE MASTER OF MY FATE,I AM THE CAPTAIN OF MY SOUL! Thanks AJ! I am Yaamini. I am the master of my fate. I am the captain of my soul. Thank you AJ for your wonderful words daily. I’m trying my best to motivate myself to do these practices regularly after reading ur words of wisdom. Abhishek-“I AM THE MASTER OF MY FATE, I AM THE CAPTAIN OF MY SOUL”. FEBE: I AM THE MASTER OF MY FATE, I AM THE CAPTAIN OF MY SOUL.” …Thank you sooooo much Awesome AJ! i just transformed 2 beautiful souls with this blog. Your really AWESOME AJ to the highest level. Loads of Gratitude Febe.. Happy to see you changing Lives. Thanks a ton AJ. Excellent article. I have not received the day two training material. Kranthi-I AM THE MASTER OF MY FATE,I AM THE CAPTAIN OF MY SOUL. PUSHKAR – I AM THE MASTER OF MY FATE, I AM THE CAPTAIN OF MY SOUL. Thank you very much awesome AJ. “Harbinder – I am the Master of My Fate, I am the Captain of My Soul.” AJ you are really awesome. AJ I haven’t received the day 2 material. Harbinder, please check your Social or Promotional tab or Spam Folder. Tons of Gratitude to You. Divyajuoti- I AM THE MASTER OF MY FATE, I AM THE CAPTAIN OF MY SOUL. Thank you AJ, you are awesome, Thank you for all of your encouraging guidelines. Prema-I AM THE MASTER OF MY FATE ,I AM THE CAPTAIN OF MY SOUL..
Dear AJ; thanks a lot for this material. I think I realize now why most of my dreams never came true, because of my -ve inner voice I became away from many dreams that I really want to achieve. But now I can change this negativity and this is a challenge. Thanks a lot. I (Doaa Magdy) am the master of my feat, I’m the captain of my soul, I’m the universe. Magical Gratitude Doaa.. I am super happy for you. I AM THE MASTER OF MY LIFE. I AM THE CAPTAIN OF MY SOUL! Deepest gratitude AJ for the great effort you put in to motivate and inspire dreamers to achieve their dreams.. I am super optimistic, and I have an amazing life, which only gets better everyday. Thank you a million times. Khirti…. I am the Master of MY fate. I AM the captain of MY soul. ” I AM THE MASTER OF MT FATE, I AM THE CAPTION OF MT SOUL.” YES, YES, YES. THANK YOU SO MUCH AJ !! GOD BLEESS YOU SIR. I AM THE MASTER OF MY FATE, I AM THE CAPTAIN OF MY SOUL. it makes Me more optimist thanks AJ for the life changing lesson You are provide. complete worth of reading to change My negative inner voice to positive one. thanks You are really Awesome. GURPREET- I’M MASTER OF MY FATE. I’M CAPTAIN OF MY SOUL. BHUVANESHWARI – I AM THE MASTER OF MY FATE.I AMTHE CAPTAIN OF MY SOUL.THANK U AJAY SIR,FOR INSPIRING US. Thanks a zillion Mahesh. Live your dreams. Moreshwar, I am Master of my Fate and I am Captain of my Soul. Thanks AJ for this awesome post. shraddha.. iam the master of my fate and Iam the captain of my soul. Thanks a zillion Christiana. Live your life being an optimist person. Yi Ning – I AM THE MASTER OF MY FATE, I AM THE CAPTAIN OF MY SOUL. You are the Gifted one Lokesh. YOU ARE MY GOD-SENT BUT I AM MY HERO. Tons of Gratitude and yes you are the Hero of your Movie called Life. I am happy that you found the way to become more positive. Live your dreams Priyanka with law of attraction and being super positive. I am the master of my fate . I am Nazima. I am the master of my fate and the captain of my soul. Thanks a lot… U r actually awesome… Bless u.. Thanks a zillion Nazima. Live your dreams with law of attraction. Yaa I am the master of my fate,I am the captain of my soul………..
Corinne – I am the Master of My Fate, I am the Captain of My Soul. I AM THE MASTER OF MY FATE, I AM YHE MASTER OF MY SOU. Manisha-I am the one destined for my greatness and I am the one living my dreams. I deserve my dream now and forever.I am the Universe in my life and that’s enough to create my abundance. Thank you universe.., I DID ACHIVE MY DREAMS. I AM THE MASTER OF MY FATE , I AM THE CAPTAIN OF MY SOUL. My name is Nurul and I AM THE MASTER OF MY FATE and I AM THE CAPTAIN OF MY SOUL…..
Elayaraja:”IAM THE MASTER OF MY FATE, IAM THE CAPTAIN OF MY SOUL”. CURTIS . I AM THE MASTER OF MY FATE AND I AM THE CAPTAIN OF MY SOUL.THANKS A LOT. I am somya. I am the master of my fate and i am the captain of my soul…. LOTS OF PEOPLE ARE LOSING TIME IN THEIR LIFE NOT CONTROLING THEIR DAYS, DESTINY, AND SOUL. ESPECIALLY, NOT KNOWING WHAT THEY WANT AND ALWAYS BLAMING AND ARE MOST OF THE TIME PESSIMIST. PUSHP- I AM THE MASTER OF MY FATE. I AM THE CAPTAIN OF MY SOULS. Melissa- I AM THE MASTER OF MY FATE, I AM THE CAPTAIN OF MY SOUL. SANTHI PERIMAL– I AM THE MASTER OF MY FATE, I AM THE CAPTAIN OF MY SOUL. Yes., I’m d only master of my mind and the Captain of my sole.. I won’t listen others, coz that voice is others., I’ll listen my inner voice and I trust my voice, I’m the positive thinker, I’ll think more and more positively, I wanna see the change in me., from now onwards I’m no more pessimistic, Im OPTIMISTIC..
Loads of Gratitude Yogesh. More success and happiness to you. Yes yes yes, i am the master of my fate, i am the captain of my soul.loads of love and gratitude ajay sir for this positive booster.you are truly awsome. I AM MASTER OF MY THOUGHT. I AM MASTER OF MY FATE. I AM THE CAPTION OF MY SOUL. Thank you so much for my magical journey with you . Levi Emeana- I AM THE MASTER OF MY FATE THE CAPTAIN OF MY SOUL. KAVENDRA SINGH DEOL – I AM THE MASTER OF MY FATE, I AM THE CAPTAIN OF MY SOUL. I AM THE MASTER OF MY FATE THE THE CAPTAIN OF MY SOUL. SHYAM KRISHNAN – I AM THE MASTER OF MY FATE!!! I AM THE CAPTAIN OF MY SOUL!! Actually your blogs are pretty boosting to focus on my dreams. I am sure I will get what I want. It is just awesome. Loads of Gratitude for all your faith. Thank You. POOJA – I AM THE MASTER OF MY FATE, I AM THE CAPTAIN OF MY SOUL. loads of thanks Ajay sir for showing the way to become an optimist. God bless you and i pray that everybody becomes an optimist and everybody lives a blessed happy life, including me. Miranda – I AM THE MASTER OF MY FATE, I AM THE CAPTAIN OF MY SOUL. Many thanks AJ for your inspirational course and daily emails – they are truly a blessed gift! TUSHAR -I AM THE MASTER OF MY FATE. ROK – I AM THE MASTER OF MY FATE, I AM THE CAPTAIN OF MY SOUL. I am Himanshu. I am pure positive energy . I am in tune with my desires and dreams.I am in my vortex.I am the master of my fate. PRASAD-“I AM THE MASTER OF MY FATE, I AM THE CAPTAIN OF MY SOUL”…………if opportunity doesn’t knock build a door. I AM THE MASTER OFY FATE AND CAPTAIN OF MY SOUL…Thank you so much Sir!! SAVITA I AM MASTER OF MY FATE ,I AM CAPTAIN OF MY SOUL. MYRA I AM THE MASTER OF MY FATE, I AM THE CAPTAIN OF MY SOUL. VAIBHAV – I AM THE MASTER OF MY FATE . I AM DIVYA. I AM THE MASTER OF MY FATE,I AM THE CAPTAIN OF MY SOUL. RAJ.. I AM MASTER OF MY FATE, I AM CAPTAIN OF MY SOUL..
Deepika- I am the master of my fate, I am the captain of my soul. Thank you Ajay sir…I have started to feel better. thank you for your guidance. Tasia- I am the master of my fate, I am the captain of my soul!!! Sri- I am the master of my fate, I am the captain of my soul. Sara – I am the master of my fate, I am the captain of my soul. Thank you! Shashi Bahuguna – I am the master of my fate and captain of my soul. HARSHAKTI – I AM THE MASTER OF MY FATE, I AM THE CAPTAIN OF MY SOUL. Lynsey- I am the master of my fate and the captain of my soul. Thank you universe!! Dr.Akarshit Gupta – I AM THE MASTER OF MY FATE, I AM THE CAPTAIN OF MY SOUL. Eshaan-I AM the master of my fate and the captain of my soul. Tons of success to You Soham. kKasHA-I AM THE MASTER OF MY FATE,I AM THE CAPTION IF MY SOUL. Chantel- I AM THE MASTER OF MY FATE. I AM THE CAPTAIN OF MY SOUL. HEMA – I AM THE MASTER OF MY FATE, I AM THE CAPTAIN OF MY SOUL. Prafull -I AM THE MASTER OF MY FATE, I AM THE CAPTAIN OF MY SOUL. DIMPLE RAJESH – I AM THE MASTER OF MY FATE,I AM THE CAPTAIN OF MY SOUL. Thank you AJ for this awesome article. I got my positivity back. I know now that every thing I desire is on its way to me. Can I get what I want in a month by LOA if I wholeheartedly believe that I already have it? Yes.. its possible unless it is against the law of the nature.. like a baby cant be delivered before 9 months ..if it does not a healthy one .. coz this is the law of the nature… if your wish is not against the law of the nature then you can manifest it for sure. Nena – I AM THE MASTER OF MY FATE, I AM THE CAPTAIN OF MY SOUL”. AJ i just want to tell you that I appreciate all that you do for us. I owe it to myself to try just one more time to make my dreams realize. I can not even think what will happen to me if this does not succeed. Once again thank you for everything. Magical Success and Happiness to You. Kunal Kumar Sinha- I am the master of my fate .. I am the captaun of my soul.. Thanks Aj for this encouraging and motivational email..
Loads of Gratitude Nilesh. Thank You. Pushpendra – I AM THE MASTER OF MY FATE, I AM THE CAPTAIN OF MY SOUL. And my body is a miracle machine..
And I am having lots of power of positivity…right now my negativity is going far from me and I am felling such like a great person..
Super Success to You Shubhit. Thank You. Aakanksha I AM THE MASTER OF MY FATE, I AM THE CAPTAIN OF MY SOUL. THANK YOU uNIVERSE AND aWESOME AJ. wow…. i realy need this .after listen my inner voice i realy feel freeeee thank you thank you ajay sir. you r awesome! VICTOR OHAZULIKE I AM THE MASTER OF MY FATE,I AM THE CAPTAIN OF MY SOUL. SHALU- I AM THE MASTER OF MY FATE. I AM THE CAPTAIN OF MY SOUL. Shruti- I am the Master of my fate. I am the captain of my soul. Lav bhogan: I AM THE MASTER OF MY FATE. I AM THE CAPTAIN OF MY SOUL. THANKS A LOT AJ FOR GIVING VALUABLE GUIDENCE EVERYDAY. YOUR EACH DAY GUIDENCE ARE BECOMING TURNING POINT IN MY LIFE. KEEP SENDING SUCH AWESOME SUGGESTIONS MORE N MORE. Ranjit Kumar Singh : I AM THE MASTER OF MY FATE , I AM THE CAPTAIN OF MY SOUL. Thanks a lot AJ… Its working great!! Awesome response from Universe… Thanks once again!! MIKHIL – I AM A MASTER OF MY FATE. I AM THE CAPTAIN OF MY SOUL. THANKYOU AJAY FOR YOUR AWESOME SUPPORT. Thank u aesome Ajay. I am thoroughly enjoying 21 days LOA course. I feel so blessed to join it. Heartfelt gratitude to u. Simple sethi arora: I am the master of my fate. I am the captain of my soul. I AM BLESSED . Glad Simple ..you are enjoying the journey. Loads of Success to you Subramaniam. You are the captain of your soul. I am the master of my fate and Captain of my soul. really wondered by seeing the results of positive attitude. Thank you AJ a ton!!! Lakisha Childs I am the Master of My Fate, I am the Captain of My Soul. I am theMaster of my fate. I Deepa am the Captain of my Soul. Thank you for raising awareness about our inner voice and for suggesting ways to bring in positivity. Thanks AJ frm sharing sch positive work.. M really seeing a positive change in me.. Thanks a lot awesome Aj…. Ur really awesome….!! Immense Gratitude Jasleen. Magical success to you. RACHANA- I AM THE MASTER OF MY FATE, I AM THE CAPTAIN OF MY SOUL. Iam the master of my fate, iam the captain of my soul. THANK YOU SO MUCH FROM BOTTOM OF MY HEART FOR YOUR AWESOME POST. I am Dikhshita Sarmah and I AM THE MASTER OF MY FATE AND THE CAPTAIN OF MY SOUL! Thanks AJ for sharing so powerful words with the community. Quite inspirational! Deboshree – I AM THE MASTER OF MY FATE, I AM THE CAPTAIN OF MY SOUL. SYAM – I AM THE MASTER OF MY FATE, I AM THE CAPTAIN OF MY SOUL. THANKYOU UNIVERSE,I DID ACHIEVE MY DREAMS. THANKYOU AJ FOR SUCH A NICE POST. THis is Datta… I AM THE MASTER OF MY FATE, I AM THE CAPTAIN OF MY SOUL!!! WOW AMAZING IT IS… THANKS A TON AWESOMEAJ.. !!!!!! APARNA – I AM THE MASTER OF MY FATE, I AM THE CAPTAIN OF MY SOUL!! I am so happy & grateful to you Awesome Aj for today’s great practice – From pessimism to Optimism. Thank you for helping me in making my life so much better. hi i ‘m Derek and i am the master of my fate I am the captain of my soul….thank you universe! thank you for bringing change in me. i am master of my fate. i am the captain of my soul. AHMED MAHROUS – I’M THE MASTER OF MY FATE IN THE CAPTAIN OF MY SOUL!!! AYUHI JHA- I AM THE MASTER OF MY FATE, I AM THE CAPTAIN OF MY SOUL. Thanks awesomeAJ . I am already fired for success I AM THE MASTER OF MY FATE AND THE CAPTAIN OF MY SOUL. SHANKARAGOUDA R PATIL– I AM THE MASTER OF MY FATE, I AM THE CAPTAIN OF MY SOUL. HEMALI ASHER- I AM THE MASTER OF MY FATE AND I AM THE THE CAPTAIN OF MY SOUL. Snehal – I AM THE MASTER OF MY FATE, I AM THE CAPTAIN OF MY SOUL. Dolly: I am the master of my fate, I am the captain of my soul. I am the master of my fate!!!! The captain of my soul!!!! N.W.- I am the master of my fate! I am the captain of my soul! Kye – I am the master of my fate, I am the captain of my soul. dear AJ, thank you to bring the change into my life. I am the master of my fate and captian of my soul…. Thank you…. Good day Aj, I’m so grateful to be your student and for the time that you are investing. Today I feel great. I’am the master of my fate, I’am the capital of my soul. I JAYNE AM THE MASTER OF MY FATE, I AM THE CAPTAIN OF MY SOUL. I LALITA AM THE MASTER OF MY FATE,I AM THE CAPTAIN OF MY SOUL. I AM THE MASTER OF MY FATE AND I AM THE CAPTAIN OF MY SOUL.I AM VIKRAMJEET. I have lived my dreams and I am gonna live it my whole life . I AM THE MASTER OF MY FATE, I AM THE CAPTAIN OF MY SOUL”. Prince Subhajit Saha . I am the master of my fate and I am the captain of my soul.. I am Prince Subhajit Saha . I am the master of my fate and I am the captain of my soul..
Amrita – I am the master of my fate and captain of my soul. I AM THE MASTER OF MY FATE AND I AM THE CAPTAIN OF MY SOUL. SAMUEL DINESH- I Am the Master of My Fate and I Am the Captain of My Soul. Thank you AJ, Thank you Universe, Thank you Me. Kenjal – – I AM THE MASTER OF MY FATE.. I AM THE CAPTAIN OF MY SOUL..
Tonnes of Gratitude to the universe and the Awesome AJ. Darshana – I AM THE MASTER OF MY FATE, I AM THE CAPTAIN OF MY SOUL. Dakshayini _ I am the master of my fate and I am the captain of my soul. Peter – I AM THE MASTER OF MY FATE, I AM THE CAPTAIN OF MY SOUL. Thank you Awesome AJ. HEENA – I AM THE MASTER OF MY FATE. I AM THE CAPTAIN OF MY SOUL. HEENA – I AM THE MASTER OF MY FATE. I AM THE CAPTAIN OF MY SOUL. THANK YOU UNIVERSE ! Rubina-I M the Master of my Fate. I M the captain of my soul. Sevil – I AM THE MASTER OF MY FATE, I AM THE CAPTAIN OF MY SOUl! For bringing positivity in my life . I AM THE MASTER O F MY FATE AND THE CAPTAIN OF MY SOUL! Love, DH. Thank you AJ for transforming so many lives…enlightening so many souls. Woder full !!! Amazing !!!!! LIVIA – I AM THE MASTER OF MY FATE, I AM THE CAPTAIN OF MY SOUL! Thanks a zillion AJ for this awesome article..
Han, I am the master of my fate, I am the Captain of my soul. I’m d master of my fate. Akshyata – I AM THE MASTER OF MY FATE, I AM THE CAPTAIN OF MY SOUL. VIKAS – I AM THE MASTER OF MY FATE, I AM THE CAPTAIN OF MY SOUL. ARCHANA- I’M THEASTER OF MY FATE, I’M THE CAPTION OF MY SOUL. I am Anna and I am the Master of my fate, I am the captain of my Soul and Mind. Thanks AJ for your work to help the world to be better place for us all, unlimited blessings for being you. Immense Gratitude to You Annalite ..More magical power to you. the excitement is becoming like a adrenal rush aj you are awesome. every word i read inspires . thank so much. i can see the transformation taking place. THANKU SIR FOR THE WONDERFUL POST. Thanks AJ, love the way you are helping us be aware of our inner voice! Rajneesh Kumar Chadha – I AM THE MASTER OF MY FATE, I AM THE CAPTAIN OF MY SOUL. I AM POISED TO SUCCEED AND I AM SUCCEEDING. EVERYTHING IS IN UNISON AND THE UNIVERSE IS VIBRATING WITH ME RIGHT NOW, I AM WINNING. THANK YOU THANK YOU THANK YOU DEAR AWESOME AJ. Melanie:) I AM THE MASTER OF MY FATE I AM THE CAPTAIN OF MY SOUL. I am magical, I am the most fortunate person and I am the strongest one. SUELLEN – I AM THE MASTER OF MY FATE, I AM THE CAPTAIN OF MY SOUL. “Yusnidar, I AM THE MASTER OF MY FATE, I AM THE CAPTAIN OF MY SOUL”. Thank you. Debra I am the Master of my Fate and I am the Captain of my Soul. Thank you so grateful to have come upon your page. ABHILASHA .IAM THE MASTER OF MY FATE I AM THE CAPTAIN OF MY SOUL. Ana Sever – I am the Master of My Fate, I am the Captain of My Soul. DR KOMALPREET KAUR- I AM MASTER OF MY FATE. I AM CAPTAIN OF MY SOUL. Akanksha : I am the master of my fate and I am te captain of my soul. Vandana – I am the Master of my fate, I am the Captain of my soul. Thank u thank u thank u AJ. I am master of my fate. I am the captain on my soul. I am the master of my fate and I am the captain of my soul. Thank you thank you thank you…writing this statement is making me feel so good. ANNE – “I AM THE MASTER OF MY FATE, I AM THE CAPTAIN OF MY SOUL”. Chao Tan – I am the Master of My Fate, I am the captain of My Soul. Yes, that’s ture. NILSY-I AM THE MASTER OF MY FATE,I AM THE CAPTAIN OF MY SOUL. I, Eunice, am the master of my fate. I am the captain of my soul. Thank you, thank you, thank you. SHIKHAR GUPTA – “I AM THE MASTER OF MY FATE , I AM THE CAPTAIN OF MY SOUL”. now I am positively manifesting my dream result in JEE ADVANCE and also my class 12 BOARD exam. thank you soo much sir.. for awesome posts. they are helping me to become even more positive . “SWAPNIL SALVI – I am the Master of My Fate, I am the Captain of My Soul. Thank you Ajay sir for writing on the inner voice. I believe it is the biggest factor in changing one’s beliefs. Nadiezhda Marie Perez Bugler- I AM THE MASTER OF MY FATE, I AM THR CAPTAIN OF MY SOUL. zillions thanks for AJ for such wonderful explanation. I AM THE MATER OF MY FAITH. I AM THE CAPTAIN OF MY SOUL. SALONI GANDHI- I’M THE MASTEREO OF MY FATE , I’M THE CCAPTAIN OF MY SOUL. Thank you i just feel good right now. Makisha- I AM THE MASTER OF MY FATE, I AM THE CAPTAIN OF MY SOUL”. Thank you so much AJ…. You are really awesome! Howard – I AM THE MASTER OF MY FATE, I AM THE MASTER OF MY SOUL. I AM THE MASTER OF MY FATE. I AM THE CAPTAINOF MY SOUL. I AM DESTINED FOR GREATNESS. I HAVE THE UNIVERSE ON MY SIDE. I thank God for you AJ, may he reward you abundantly. Bhavin – I am the master of my fate. I am the captain of my soul. Thank you very much Awesome AJ. “I am the master of my fate,I am the captain of my soul”. I AM TYLER. I AM THE MASTER OF MY FATE, I AM THE CAPTAIN OF MY SOUL! Anshuman Maitra – I AM THE MASTER OF MY FATE, I AM THE CAPTAIN OF MY SOUL. Gail M: I AM THE MASTER OF MY FATE. I AM THE CAPTAIN OF MY SOUL. Swati- I am the Master of my Fate , I am Captain of my soul . Sarika.I am the master of my fate and I am the master of my soul. Stefani S. – I am truly the Master of My Fate, I am truly the Captain of My Soul. Thank You so much for giving me a new and simple way to expand my knowledge of the Law of Attraction. I am so grateful for your guidance that I can’t wait for tomorrow’s lesson. Candace: I am the Master of My Fate, I am the Captain of My Soul. I AM SANJAY MAHADEV JATEKAR, I AM THE MASTER OF MY FATE, I AM THE CAPTAIN OF MY SOUL”. Natasha- I AM THE MASTER OF MY FATE AND I AM THE CAPTAIN OF MY SOUL.. THANK YOU! THANK YOU! THANK YOU! AJ..you are awesome. Priya–I am the master of my fate , I am the captain of my soul..Thank u so much Rj sir.. I AM THE MASTER OF MY FATE AND I AM THE CAPTAIN OF MY SOUL . THANK YOU AWESOME AJ. I AM LOVING THIS TRANSFORMATION. Nidhi- I AM THE MASTER OF MY FATE; I AM THE CAPTAIN OF MY SOUL!!! Mitesh Patel : I am the master of my fate, I am the captain of my soul. I am Lokesh And I am the Master of My Fate, I am the Captain of My Soul. Thanks AJ For Guiding Us. Maya – I am the Master of My Fate, I am the Captain of My Soul. I’m the master of my life and Captain of my Soul.Period!!! I AM GOPINATH, I AM THE MASTER OF MY FATE, I AM THE CAPTAIN OF MY SOUL”. I am magical.Iam the most fortunate person and I am the strongest one. I am the one destined for my greatness and I am the one leaving my dreams.I deserve My dream now and forever. I am the universe of my life and that’s enough to create my abundance. I am the Master of my fate.I am the captain of my soul . Machogu Isabella.I m the Master of my fate,Iam the captain of my soul. Neel -I am the master of my fate and I am the captain of my soul! I AM THE MASTER OF MY FATE AND I AM THE CAPTAIN OF MY SOUL! Ekta- I am the master of my fate and I am the Captain of my Soul. Thank You . Thank You. Thank You. SHAILI SHAH – I AM THE MASTER OF MY FATE AND THE CAPTAIN OF MY SOUL. I WILL ACCOMPLISH ALL MY DREAMS! I AM THE MASTER OF MY FATE , I AM THE CAPTAIN OF MY SOUL . Thank You AJ for the guidance. I am especially grateful for the AJ’s class that i have manifested. Vikraman, I am the Master of my Fate and I am the Captain of my Soul. Vikraman Kumaravel, I am the Master of My Fate and I am the Captain of my Soul. Gain so much of positivity. I sure that this gonna change my life. ANUPAM SADHUKHAN- “I AM THE MASTER OF MY FATE, I AM THE CAPTAIN OF MY SOUL”. SHEETAL – I AM THE MASTER OF MY FATE, I AM THE CAPTION OF MY SOUL. VARUN- I AM THE MASTER OF MY FATE I AM THE CAPTAIN OF MY SOUL. Shikha Rana– I am the Master of My Fate, I am the Captain of My Soul. Rehan – I AM THE MASTER OF MY FATE, I AM THE CAPTAIN OF MY SOUL. Surabhi – I am the master of my fate and the captain of my soul. Purvi sancheti-i am the master of my fate and the captain of my soul. Richa Gaikwad – I am the master of my fate and the captain of my soul. JG – I am the master of my fate and i am the captain of my soul. Thank you Universe!!! I – Laetitia – am the master of my fate, and I am the captain of my soul. Only three days into this course and I can feel my inner self filling with power, positivity, faith in the Universe and gratitude ! Thank you so much, AJ and the Universe. Olaoba Oluwagbemiga Dare – I am the master of my fate, I am the captain of my soul. Awesome AJ, you’re the best. Aju – I am the Master of My Fate, I am the Captain of My Soul. I am master of my fate, I am captain of my soul. I’M THE MASTER OF MY FATE , I’M THE CAPTAIN OF MY SOUL. Its very grateful to me sir. Thank you very much. I am K. Elango master of my fate and captain of my soul. Shweta- I AM THE MASTER OF MY FATE AND I AM THE CAPTAIN OF MY SOUL. SUMIT – I AM THE MASTER OF MY FATE AND I AM CAPTAIN OF MY SOUL. I AM THE MOST FORTUNATE AND THE STRONGEST PERSON. Ramalakshmi -Im the master of my fate and I’m the captain of my soul. U r changing my life a lot..
Afzal Mondal- I am the master of my fate. I am the captain of my soul. I am safna, I am the master of my fate and I am the captain of my soul. Thanks for this wonderful post, it came to me at the right time. Avtar Sandhu – I am the Master of My Fate, I am the Captain of My Soul. I am the Universe in my life and that’s enough to create my abundance. Thanks AJ for the great motivational and inspiring guidance.